Looking to capture the beauty of the Great Enchantress on film? 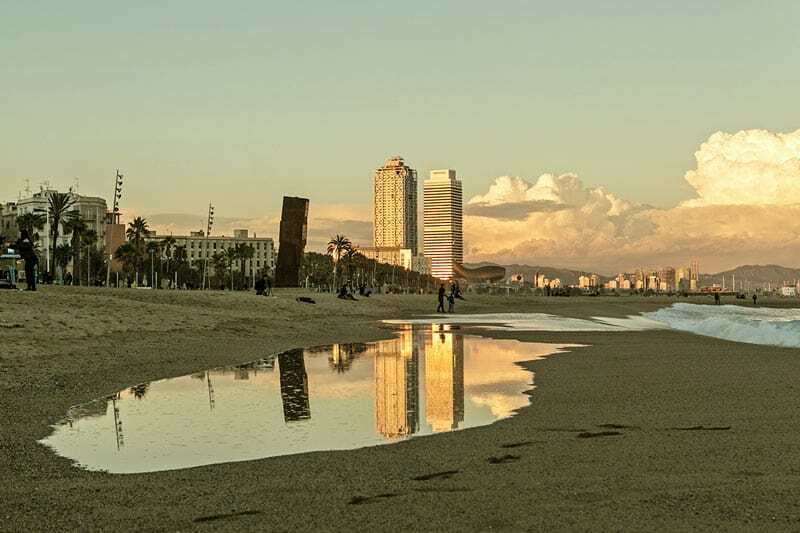 We invite professional photographer Fran Goncalves, director of Shutter Kings Photo Tours to share the most photogenic locations in Barcelona… all photos his own. 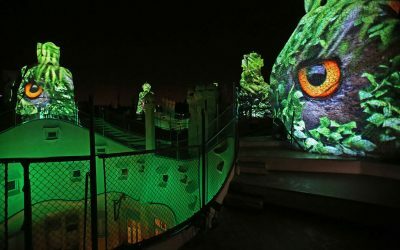 With its abundance of magnificent medieval behemoths, its ubiquitous Catalan art nouveau treasures, and colourful bursts of eye-catching modern architecture, Barcelona is every photographer’s dream. Crowned with the unique visions of the architect, Antoni Gaudi, it’s no exaggeration to say that the Catalan capital is one of the most photographed cities in the world. 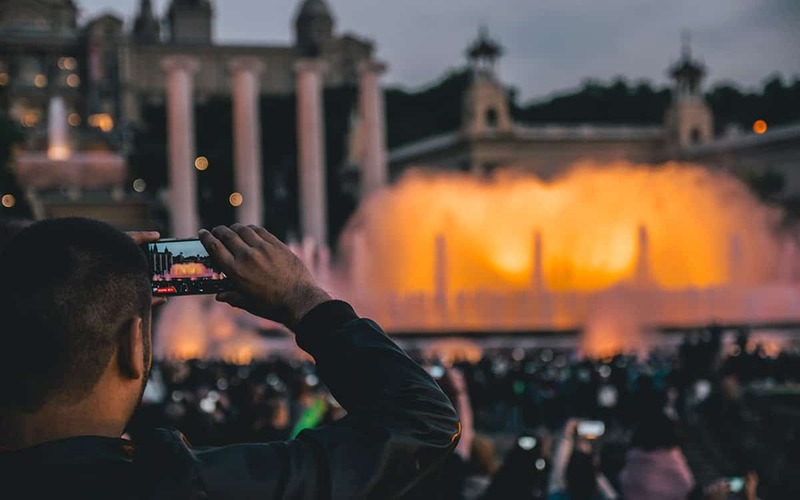 There are literally hundreds of amazing places to capture with your camera, but if you really want to skip the classic tourist shots… then take a look at this list. There are literally hundreds of amazing places to capture with your camera, but if you really want to skip the classic tourist shots and treat your portfolio or social media timeline to some truly cool photos, then take a look at this list. 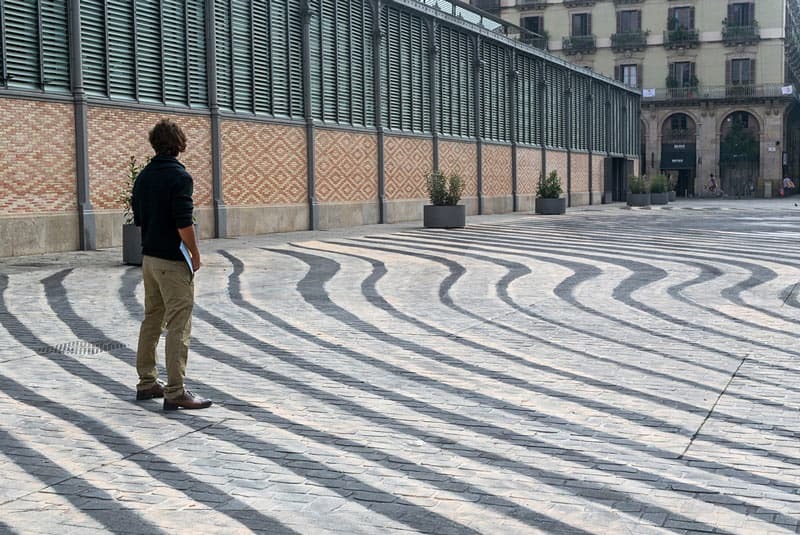 Whether you’re an old school professional shooting with a DSLR, or a travel influencer looking for the most Instagrammable spots in Barcelona, these locations will offer your lens plenty of material to work with. I’ve also tried to offer some tips on taking the best possible shots while you’re there. 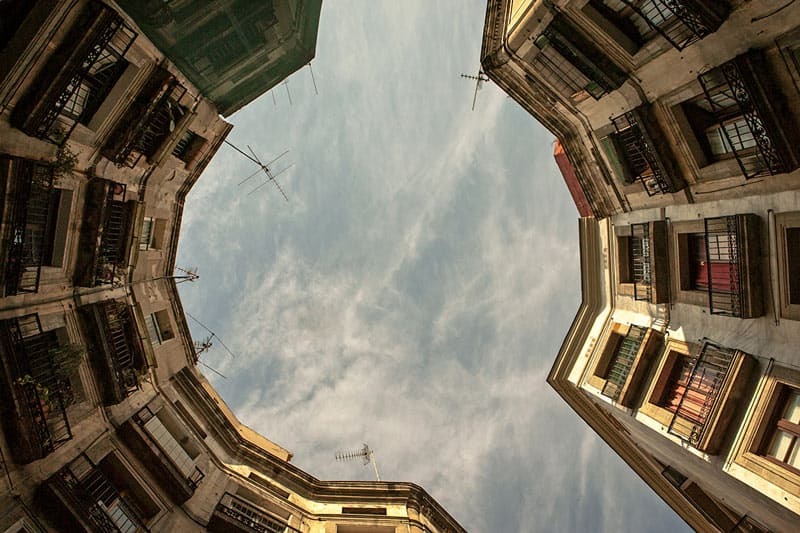 Next to the iconic Ramblas, El Raval is the most multi-cultural and diverse neighbourhood of Barcelona, so if you’re a street photography enthusiast, this is the place to be. 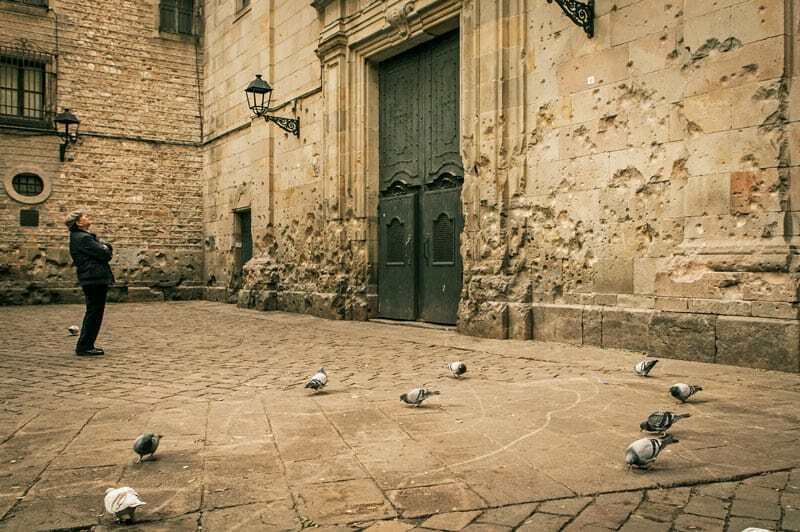 There are loads of great characters and people watching opportunities (obviously abide by the rules of courtesy when shooting people), and several signature locations like La Rambla del Raval, the courtyard of the old Gothic hospital and Plaça del Angels (which I mention later in this guide). Pro tip: For amazing light coming through the narrow and full of hanging clothes streets, go an hour before sunset… specially at Tallers street! 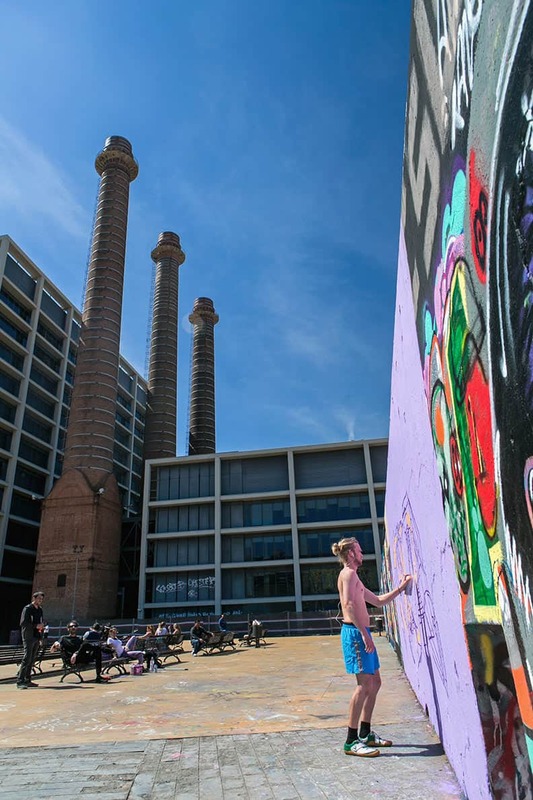 On its way to become the modern district of Barcelona, the area of Glóries is going through a lot of changes. 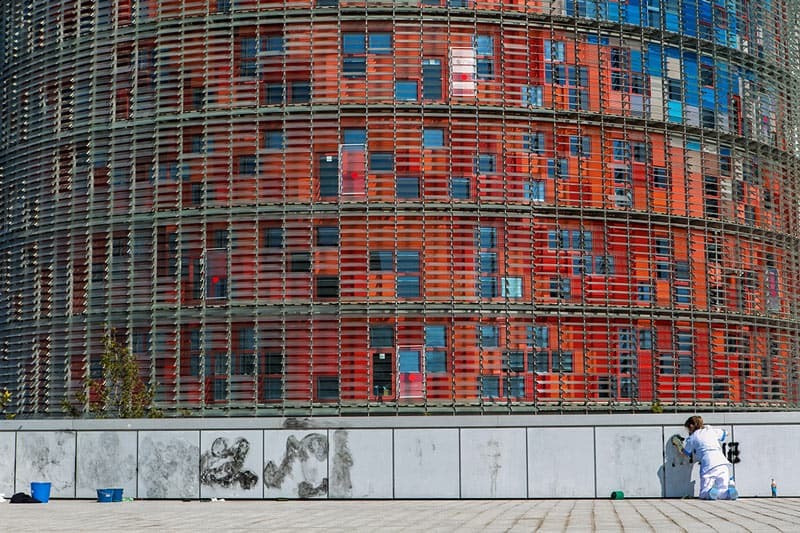 With the smart buildings and brand new museums, this is place to take advantage of all the geometry, colour and shapes that its modern architecture affords the photographer. There are many intriguing new buildings here, but I particularly like the new spacecraft-shaped Encants flea market infrastructure and its glass rooftop, which appears straight out of Star Wars. You can also visit the market for second hand articles and some bargains (be aware that it’s closed on Tue, Thu and Sun), although the vendors prefer you to buy their stuff than photograph it. 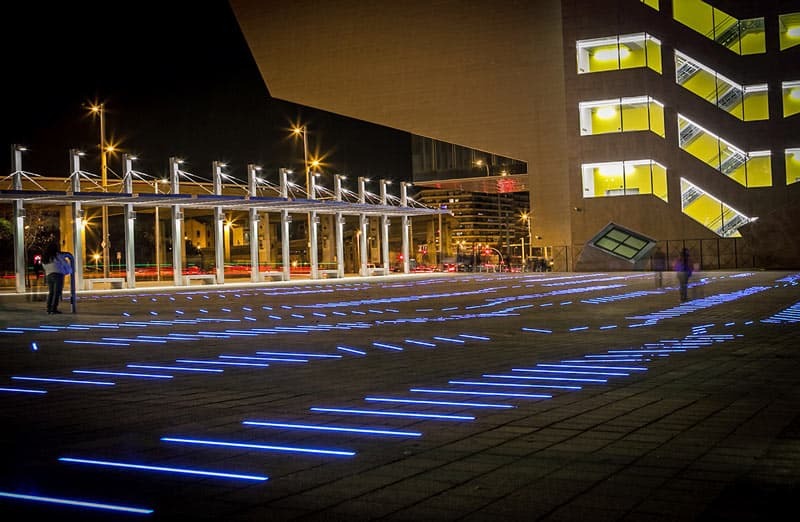 Pro tip: For some super cool images, bring your tripod after the sun goes down to try some amazing long exposure shots of the lighted Agbar Tower and the lights display at the Plaça de Glòries square. Street art lovers, this is your paradise. 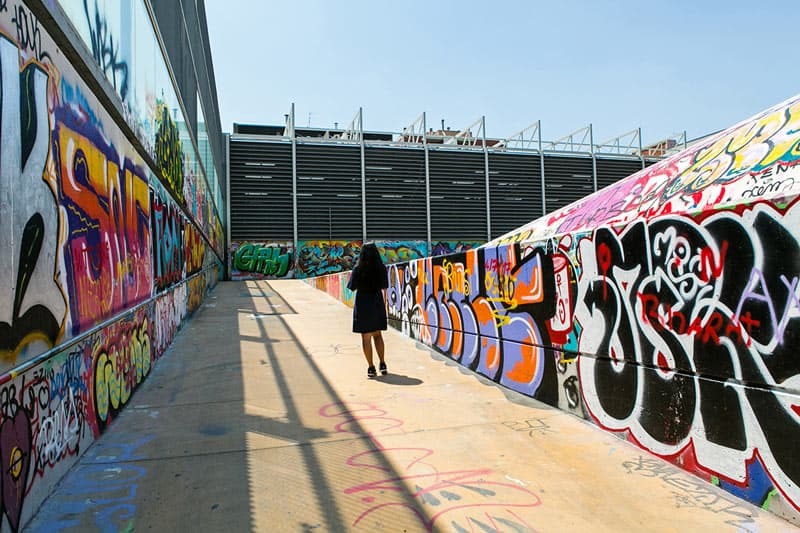 This concrete park is rich with graffiti-covered walls that are in a constant state of renewal… and if you’re lucky you might even run into one of the world’s top street artists in action. It’s easy to find them working on the walls and, since in this place it is perfectly legal to paint, they’re not hiding and usually open to be interviewed or photographed. Pro tip: The ideal time to go here for photos are on sunny and bright days, so the colours of the graffiti works stand out even more. 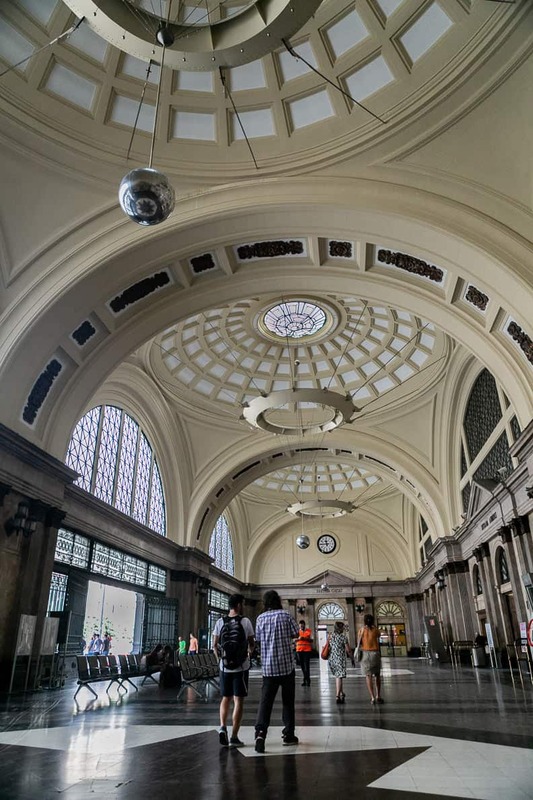 The last remaining classic train station of Barcelona is a mine of cool photo opportunities! 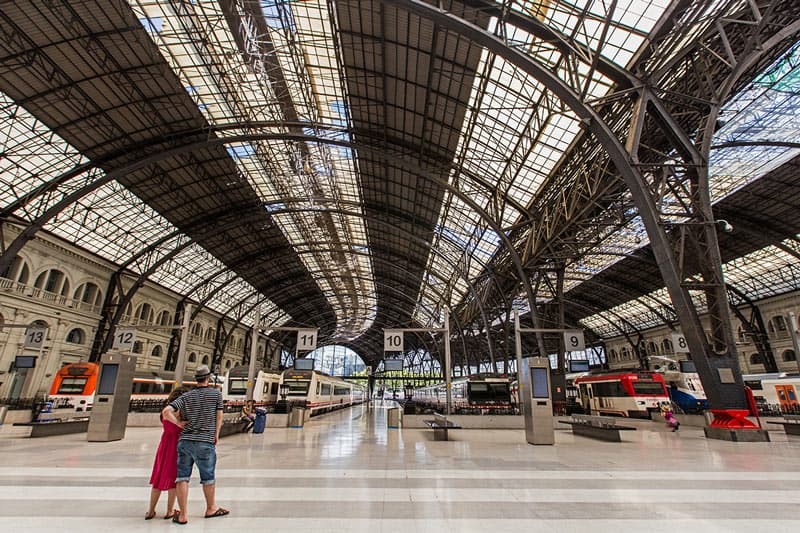 The steel structure of the ceiling and the curved platforms are a perfect canvas to compose your pictures, along with the way light filters in from the roof. 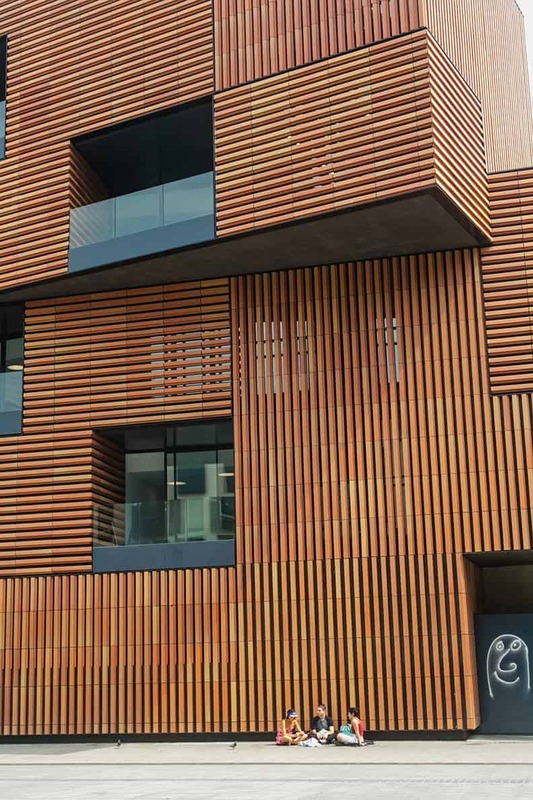 Not only that, but the distinctive brown and cream aesthetic of the main foyer is also extremely photogenic. The best part, for shutterbugs, is that there are no turnstiles to access the trains area, you can walk in and get as close as you need to get your shot. Pro tip: if you have a fancy camera and big lenses, try to be discrete or use a smaller device, since lately some security guards are asking for signed permissions to take photos in this place if they consider your equipment to be professional. Once the home of anti-aircraft guns, now this place – at the top of El Carmel mountain – only guards the best views of the city. Until not so long ago, this was a hidden gem of the city. Now it’s one of the most popular places for photo lovers… but it’s still well worth a visit, even if you’re not into selfies. Why? 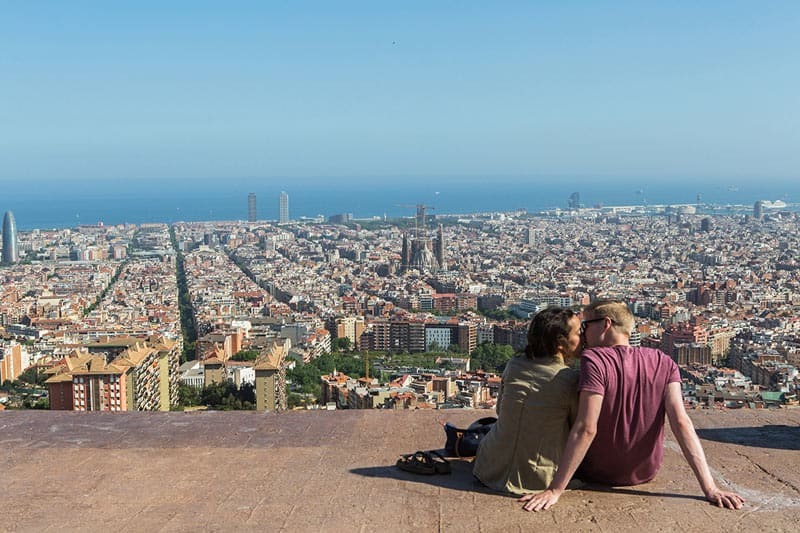 Because, even when it is crowded, everybody is enjoying themselves so you’ll find a lot of photo opportunities with improvised models, together with great shots of the city skyline and the Mediterranean. Pro tip: The views may be magnificent, but some human presence make the photos more urban and real. If you’re not comfortable incorporating strangers into your shots, bring your partner or friend and get them to pose for you. 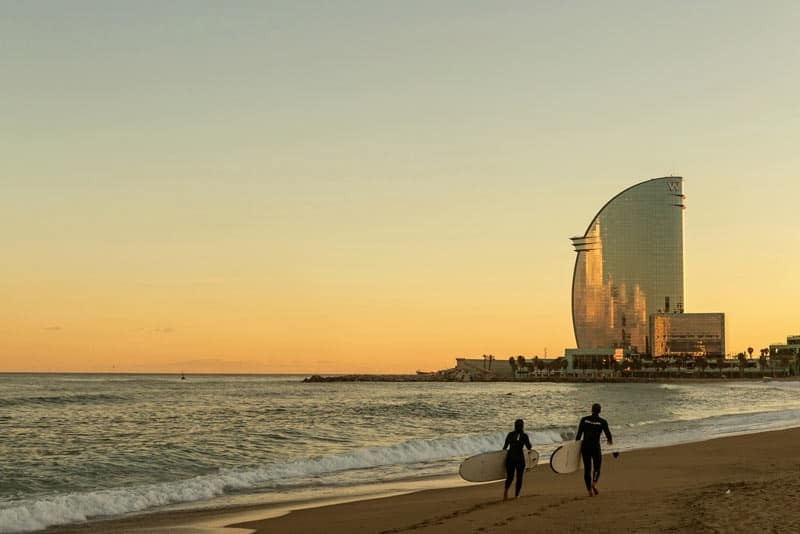 Bustling with people during the summer, safe haven of surfers during the winter, La Barceloneta beach area offers different photo situations depending on the time of year. There’s always something going on, on the sand and out of it, so go and look around for a different angle. Needless to say that sunrise and sunsets make for amazing shots at this location. You can even take photos while you sit at one of the many beach bar terraces with your favourite drink in your hand! Pro tip: Try arriving when the light is softest, and keep an eye on the horizon. When it’s not perpendicular to your shot, it can make your photo look amateurish. This medieval district is full of gorgeous narrow streets, so narrow that on some of then you could touch both sides if you open your arms! Some of the most iconic buildings of the city, such as the Gothic Cathedral, are located in this area so expect many tourists around… but if you dare to go off the beaten track you might find really amazing spots, so getting lost won’t be that bad after all. For every famous corner, there is at least one unknown treasure. Pro tip: If you want to capture some famous landmarks like the Pont del Bisbe bridge, or Plaça de Sant Felipe Neri, just set the alarm to wake up early in the morning (or stay up til late at night and bring your tripod) to avoid the large crowds! 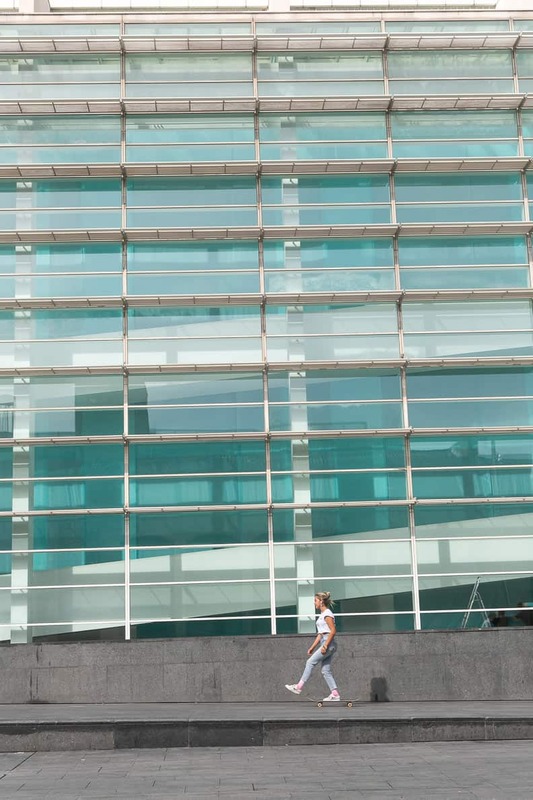 Designed by the renowned architect Richard Meier, the MACABA Museum is the background of this amazing square that somehow became the Mecca of skaters in the city. No matter your photography skills, it won’t be difficult to frame one of these extreme sports lovers in front of the many lines and squares of the museum building. Also, its a popular meeting point for all kind of urban tribes, in case you’re looking for portrait opportunities. 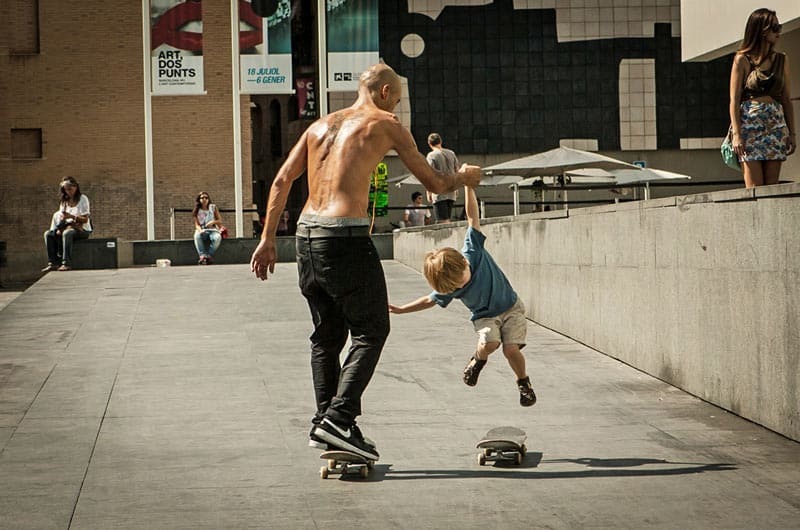 Pro tip: A fast shutter speed is essential for capturing skateboarders on the move. If you don’t have a state-of-the-art DSLR, you might want to go earlier in the afternoon when there is more natural light, rather than the very end of the day when cheaper lens and phones may struggle to take sharp shots. 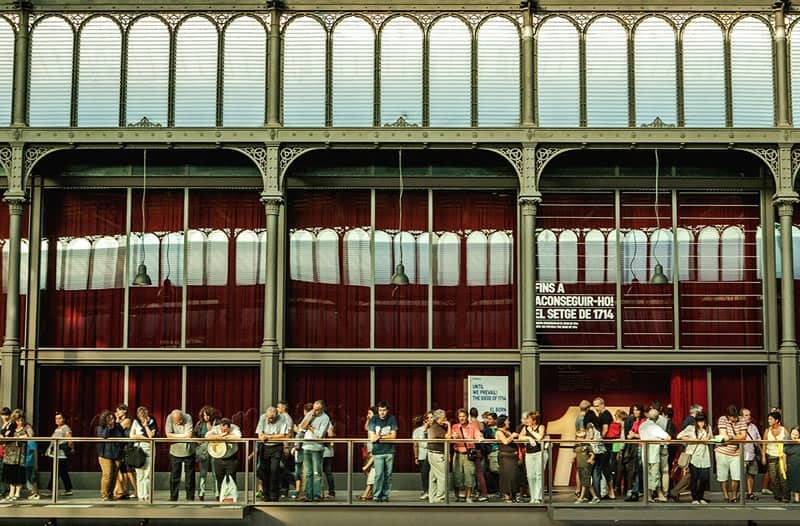 The Mercat del Born was one of the first iron structures in the city, but after falling into disrepair was due to be restored and reopened as a library. That was until workers found ruins of the medieval city that was destroyed on the 1714 Secession Wars, and the decision was made to reopen it as a cultural centre instead to display these historic remnants. Besides its historical importance, this attractive location offers a lot of geometry and cool background details for experimenting with different angles. Plus the light coming from the main door is good for some nice backlight shots. Also it has probably the best public toilets of the city in case nature calls in the middle of your photo hunt. Closed on Mondays. Pro tip: Adjusting your camera height and changing angles can help create new and interesting compositions. If you were into emo music at the beginning of the 00’s, you’ll recognise this square from the Evanescence music video of their hit My Immortal. The truth is even sadder than an emo love song however, as this plaza was twice bombed by the fascist planes during the Civil War, killing 42 people, mostly children from the school that still exists on the square. 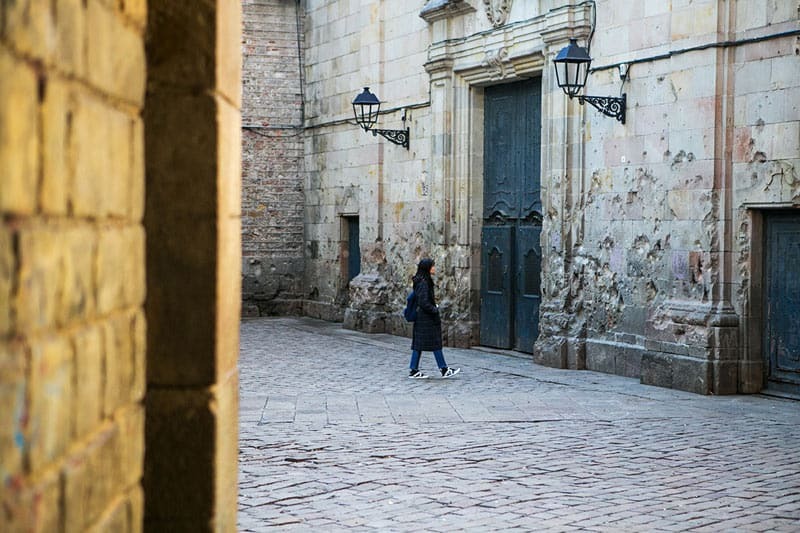 The partially-destroyed walls of the plaza‘s church are a reminder of these terrible times. They also form an evocative and poignant background for photos. Pro tip: The ambience is this place is special, and even more during spring time since all the ground gets covered with tiny yellow flowers so try shooting from feet level. During weekday mornings, the square may be closed as it is used as a playground for the kids of the school. 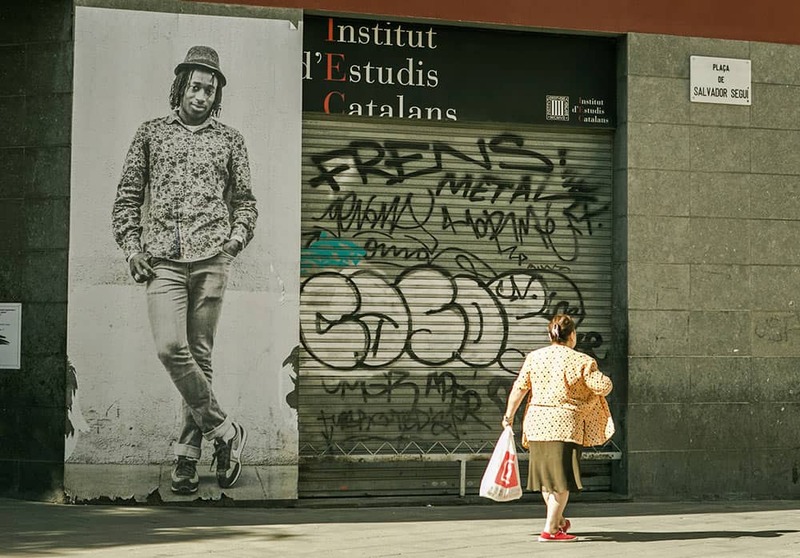 If I could only go to one place to takes photos in Barcelona, it would be El Born district. 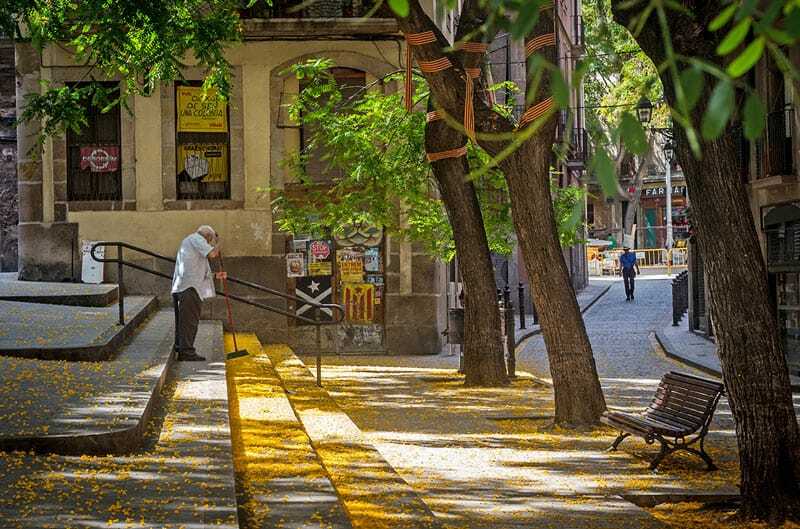 An amazing mix of old, new, narrow streets, open spaces and street art, the district lies in the city centre but without all the hustle of the Gothic Quarter. Wander around the streets and look for shadows, textures and always keep looking up for some of those that are decorated with pennants, stars or lightbulbs that will look great if you’re looking for a place for a city photoshoot of a model or loved one. More on the district here. 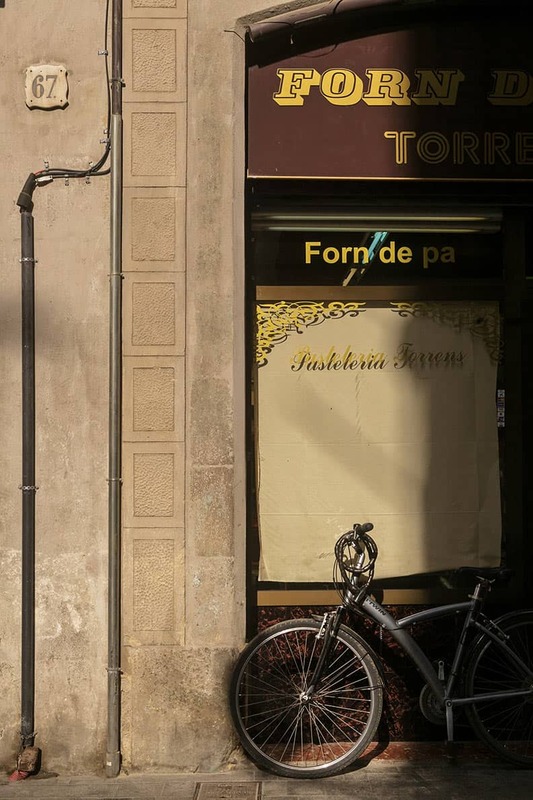 Pro tip: El Born narrow streets are great for street photo compositions… just check where the sun is and shoot in the opposite direction to avoid that bleach effect on the upper part of your pictures. And don’t let rainy days ruin your plans! Look out for puddles to get some amazing reflections and vibrant colours on those streets with decorations. 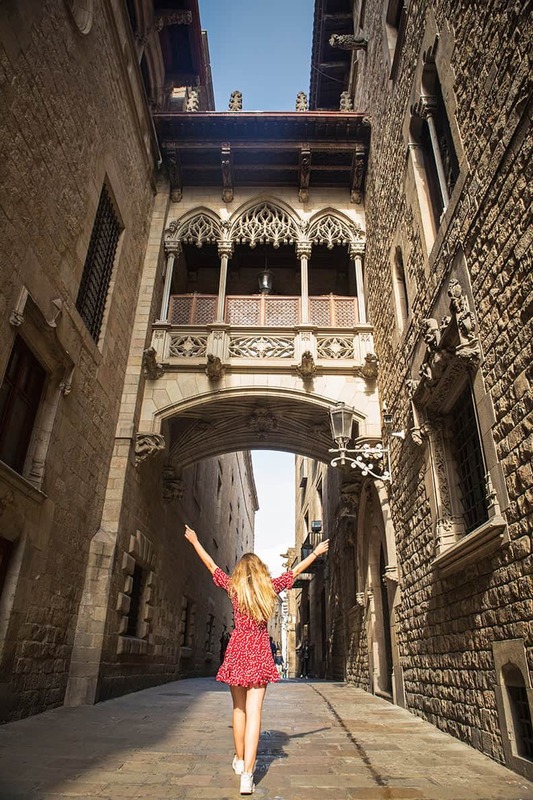 It’s one thing to know all the cool places to go, but visiting them in the company of a professional photographer can really help you elevate your photos, and to capture all the magic of Barcelona in the best way possible – and the lessons you learn are something you can take with you to your next travel destination too. For that reason I started Shutter Kings Photography Tours, to help people improve their skills behind the lens, no matter what camera you have or what level of knowledge you currently possess. For many, it’s a great opportunity to clear up any doubts you have about how to use all the features on your camera or phone, and to master those options you might have been struggling with in manual mode. We have a small and passionate team of guides who know all the best places and spots, and if there’s a specific corner that you’re looking for that perfect photo in your mind, we can take you there and help you capture the image you’re looking for. We also offer photo shoots, if you’d prefer to be a model for the day. Whatever your photography needs, just get in touch with me any time! 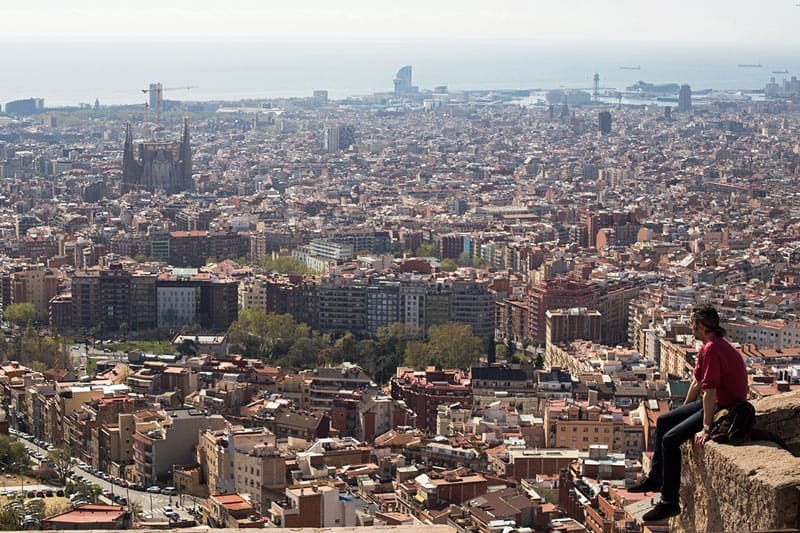 Fran is a professional photographer and photo journalist reporting on Barcelona. 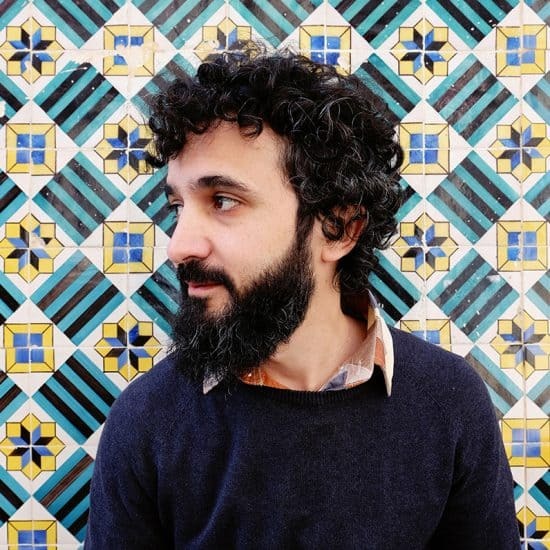 He is also the man behind Shutter Kings Barcelona, a company that offers photo tours and photoshoots to curious travellers.